Mega Sale! 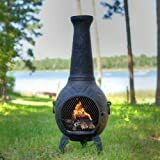 Up to 26% off on Chimineas at Option Ridge. Top brands include The Blue Rooster, Deeco Consumer Products, Better Homes and Gardens, Unknown, & Oakland Living. Hurry! Limited time offers. Offers valid only while supplies last. 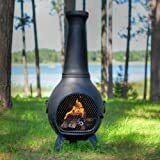 The Blue Rooster Co. Dragonfly Style Cast Aluminum Wood Burning Chiminea in Charcoal. 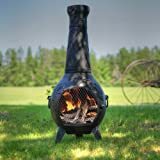 The Blue Rooster Co. Prairie Style Cast Iron Wood Burning Chiminea in Charcoal. The Blue Rooster Co. Gatsby Style Cast Aluminum Wood Burning Chiminea in Charcoal. The Blue Rooster Co. Butterfly Style Cast Aluminum Wood Burning Chiminea in Charcoal. The Blue Rooster Co. Rose Style Cast Aluminum Wood Burning Chiminea in Charcoal. The Blue Rooster Co. Butterfly Style Cast Aluminum Wood Burning Chiminea in Antique Green. The Blue Rooster Co. Pine Style Cast Aluminum Wood Burning Chiminea in Antique Green. The Blue Rooster Co. Butterfly Style Cast Aluminum Wood Burning Chiminea in Gold Accent. The Blue Rooster Co. Prairie Style Cast Aluminum Wood Burning Chiminea in Charcoal. 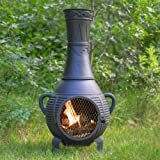 The Blue Rooster Co. Grape Cast Iron Wood Burning Chiminea in Charcoal. The Blue Rooster Co. Grape Style Cast Aluminum Wood Burning Chiminea in Charcoal. 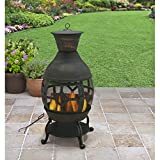 The Blue Rooster Co. Orchid Style Cast Aluminum Wood Burning Chiminea in Antique Green. The Blue Rooster Co. Pine Style Cast Aluminum Wood Burning Chiminea in Charcoal.